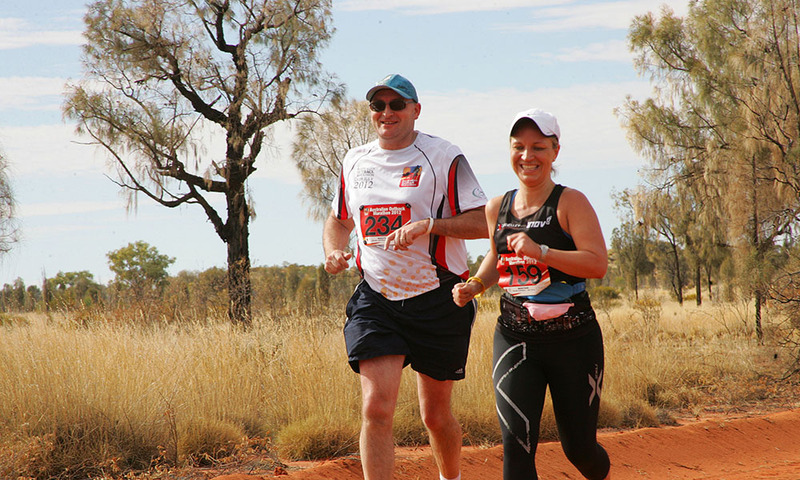 Jayne Andrews ran the Outback Marathon 2012 she is one of my most committed PT clients for about a year now. 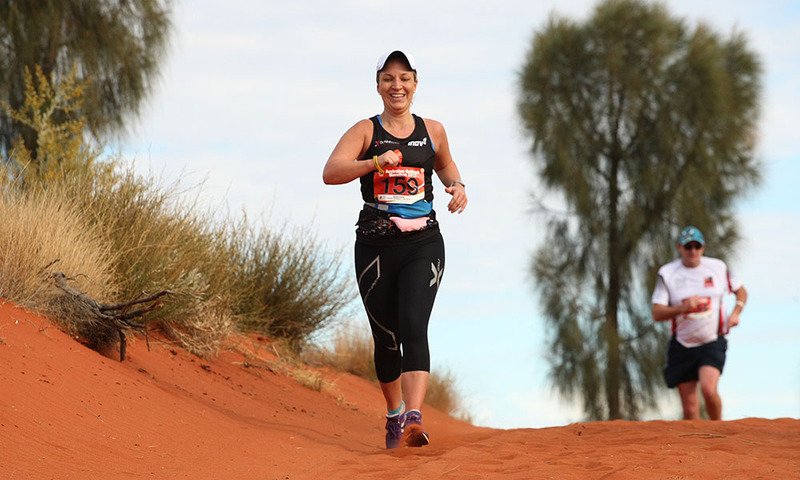 After running a Team Event Coastrek 50km Palm Beach to Balmoral Beach in March 2012, she decided that she wanted to do the Outback Marathon at Uluru. It was mainly on a trail and sand so I really encouraged her to enter the event. We then worked out a training program. Jayne fought her way through injuries and illnesses. Yet she remained committed athlete. She always turned up to training no matter what. Jayne always completed her long runs. Only 4 days before the Outback Marathon she arrived at training at 5:45am after having gastro the day before and clearly sick as a dog with a fever and suffering from the Flu. I sent her home early from her PT session as she could barely manage a sit up. 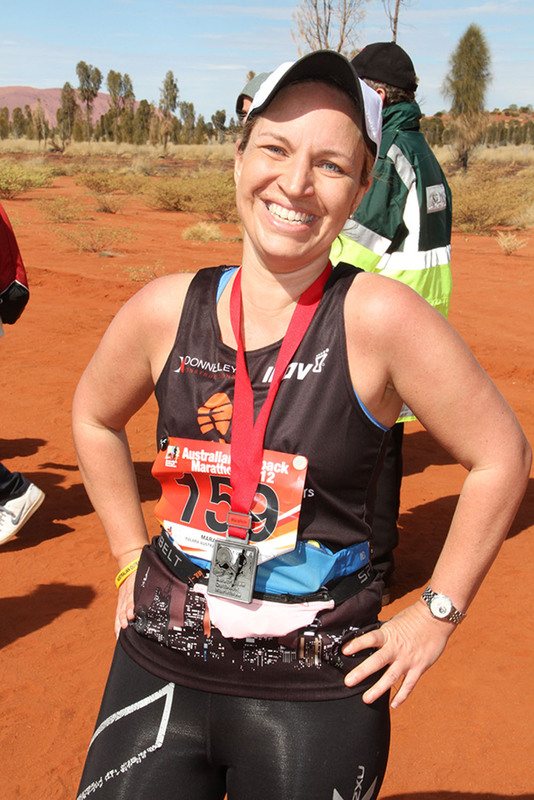 I was not sure if she was going to make the full distance of the Outback Marathon 42.2 Kms only 4 days later. Jayne showed her true sprit and surprised me. She ran a PB on a tough course with over 8 sand dunes to cross. Even with the Flu and all the sand dunes she managed a PB by 7 minutes. Well done Jayne. Jayne is an inspiration and I am so proud of her. Here is her race report. I headed to the Outback Marathon with my friend Gemma, arriving at Ayres Rock full of trepidation on the Friday night. The marketing propaganda for the race had said it was mainly flat and ideal for a PB, but with only 130 odd runners, I was worried they would all be seasoned marathon runners and I would most likely come in last. On Friday evening we had our race briefing. 12 nationalities running the Outback Marathon, with a large contingent of Spanish who were the favourites to win, as well as some who were doing 12 marathons in 12 months, one on each world continent and a couple planning to get married if they finished the race. It was hard to tell if I would come last, as the group was sprinkled with some people doing the 6k, 11k and half courses – who didn’t need to be as fit. There were also some Aboriginal children kindly sponsored by Travelling Fit to do the 6k. A mixed bunch. I eagerly looked round for a few people who looked fatter than me…not many. There wasn’t much I could do at this point, so headed for the pasta party and ate as much as I could fit in. We woke at 5.30am after the usual disturbed, nervous sleep. We’d heard the breakfast was going to consist of mainly fried foods, so Gemma and I went armed with our box of oats (just in case). The bus took us to the foot of Ayres Rock just before sunrise. An amazing sunny glow engulfed the portaloo queue as the sun rose over the nervous runners (and the rock). The organisers blasted out some awesome tunes from the loud speakers and we danced to keep our nerves at bay. At 7.40 we moved toward the start line….not long now. There was a certain level of irony having the Olympics start on the opposite side of the world, at the same time – we were probably just as nervous as those guys! As the race started we could barely feel our toes and fingers. The temperature was about 2 degrees and continued to be for at least the first 5 km of the race. For the first 2 kms I ran with Gemma. We had done several training runs together and I knew it wouldn’t be long before she sprinted off in to the horizon. At 2kms I realized I shouldn’t try and keep up with her if I were to last the 42km. She sprinted off….and I ran alongside an American lady who we’d met at dinner lady for the first stretch of the race. As we turned a corner at the 5km mark, a beautiful fruit orchard appeared. We were later to pass this on the way back…at about the 37K mark. Sand wasn’t the only thing beneath our feet. There was also camel poo. Hop, skip and jumping the poo (while I had energy still) became a fun game as the boredom set in, and miles and miles of red sand just took us onwards. As the Outback Marathon progressed, the desert began to feel empty and silent. Bumping in to other competitors became few and far between and often you could stare in front and behind and see absolutely no one. It was scary but exhilarating. Eventually, at about 12km I made a new friend (the American lady had out run me as well). I could hear a sloshing sound in my right ear. It was the sound of a guy with an ill-fitting pack with the water sloshing back and forth. It wasn’t loud but in the silence it started to become marginally irritating. After a few Km’s of him following me, I realised he was pretty hot. A bit of banter started at about 15km as I tried to out run him (it was my turn to out-run someone!). A welcome distraction from the pain that was starting to set in. By this point I felt like I had half the desert in my shoes. At about 20km I pushed myself on with the hope of a date by the end of the race – then the bugger turned off at the Half Marathon fork in the track. Damn, he was only doing the half! He ran off to his finish line…never to be seen again! It was actually lucky for my pride that he disappeared, as I managed to get Gatorade in my eye at the next checkpoint and probably wasn’t looking so hot myself. At the 21km mark, another flippin’ sand dune appeared on the horizon. And what was to become a familiar sight – a bloody photographer. At every sand dune, one sat – waiting for their prey. Didn’t they realise it was impossible to run up sand, hold stomach in, and smile – all at the same time. Just as I flipped the bird at them and grimaced…a welcome sight appeared. Some young aboriginal children appeared from behind the bushes and started to run along-side me, cheering and laughing. It was just what I needed to boost me through this half way point of the Outback Marathon. As the Outback Marathon progressed, the aches set in. By this point, it was late morning and the sun was heating up. I could feel my English skin starting to cook and my face dry out in the dust that was everywhere. I then tried to focus on where I was, and really appreciate the landscape. This was a once and a lifetime opportunity. How many people could say they had run through the outback? I had Ayres Rock on one side, The Olgas on the other and helicopters buzzing overhead (taking more snaps) – it truly was amazing. At about 30km a long bitumen road appeared (one of the only real roads on the course) and seemed to go on forever. The only thing keeping me sane was….’imagine telling this story when you go back to London’. I could now see the finish line in my sight. But the markers were confusing and I started to drift the wrong way (easy to do when you are exhausted). People were standing near the end yelling at me to go the right way…..and eventually I managed to sprint to the finish. How the heck we can always manage to find that extra energy to sprint to the line, I will never know. But my relief and elation was a short-lived. As I crossed the line, Gemma bounded over to me looking distraught. She had only finished a minute ahead of me!?! I had possibly done better than I expected to keep up with her (but this was unlikely!). She declared her race had been a disaster as she had tried to race-down an American guy who was just ahead of her for most of the race. He had taken a wrong turn and they had both got lost for 4 extra kilometres. She had run 46kms. She wanted her time cancelled and was overcome with disappointment as she would have otherwise certainly been a contender for top 3, or at least won her age division. I felt sad for her but a little deflated. My success was her disaster and she had run an extra 4kms on me. I left her to dissect her race as I started to realise I was wheezing and coughing red stuff up (dust not blood, thank goodness). I sat in the calm of the St John’s Ambulance tent breathing in their oxygen for 15 minutes as their doctor took my blood pressure. He asked me which race I’d done and he said ‘Wow, your blood pressure is good considering. You’re really fit. Not many people could have run that.’ I snapped back to reality and realised, I had done well. Only 128 people had run the Outback Marathon (only about 300 ever) and it turned out I was in the Top 50 (9th in my age group out of 23). Maybe I wasn’t a loser after-all. And I definitely didn’t come last.